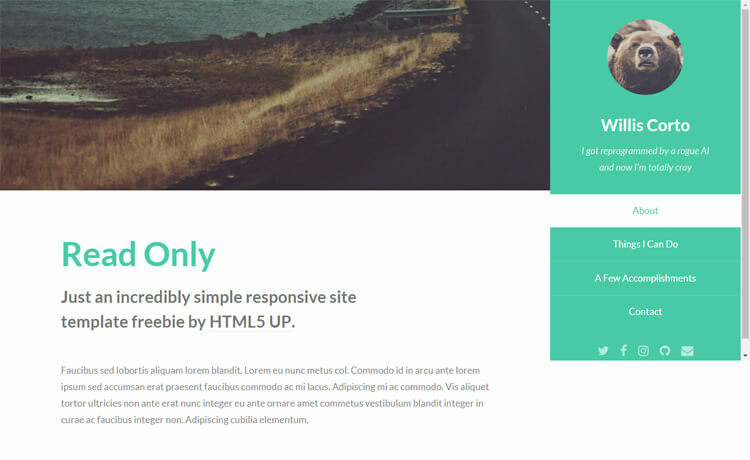 Read Only is a free HTML5 multi-purpose website template. It contains modern and useful features like custom scroll bar, fixed sidebar navigation with scroll spy, contact form. Read Only is a free HTML5 multi-purpose website template. It is suitable for personal portfolio, blog or personal sites though it will work for other categories too. Moreover, It is a responsive and one-page template with a clean and minimal design. Read Only contains modern and useful features like custom scroll bar, fixed sidebar navigation with scroll spy, contact form. In addition, it has an intuitive and a well-structured code inside the package which will guide you throughout the development journey. Create a stunning project with Read Only. Thank you for downloading Read Only.